Sky Poker employ the strictest anti-hacking security standards so you can deposit and withdraw your money with absolute confidence. Sky Poker is one of the most popular online poker rooms among UK online poker players because of its lucrative promotions and bonuses. 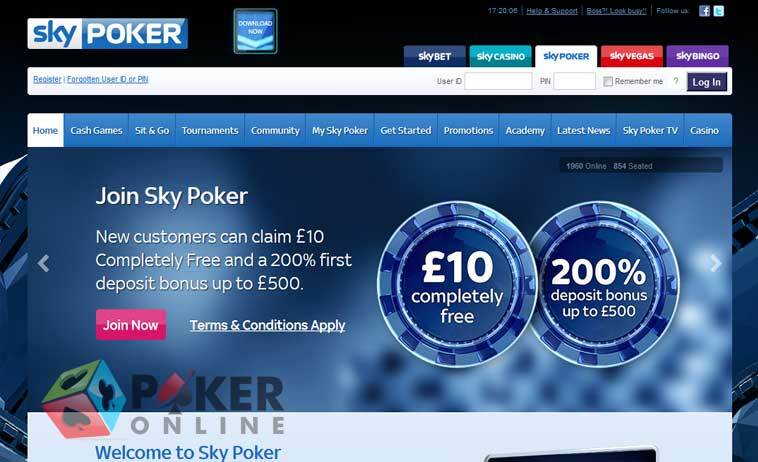 Remember to get your Sky Poker Bonus Code for great bonuses Sky Poker is among the most popular online poker rooms in the UK, enabling UK online poker players to play in pounds without having to download any bulky online poker gaming software. Besides, Sky Poker has exciting features such as the Sky Poker TV, which shows players as they play their hands. Sky Poker is also home to a dynamic and lively online poker gaming community, which comprises features such as poker blogs and forums. Sky Poker offers newly registered players free tournament tokens worth £20, provided they enter the promotional code POKER while registering an account. This token can be used to participate in SnGs and online poker tournaments at Sky Poker. Besides, players can grab a welcome bonus of £500, which they can clear in increments of £10. All players need to do to clear £10 of their bonus is to collect 250 poker points through real money poker play. Sky Poker has given new players a deadline of 30 days within which they have to clear their bonus. Earning poker points is simple because all players need to do is play real money poker games and they will be rewarded with poker points, which they can use to redeem their bonus. The New Player Freeroll £1500 is another exciting reason for players to register at Sky Poker. These freerolls are played on Tuesdays at 7:30 p.m., giving players a grand chance to plump their bankrolls. One of the features that makes playing at Sky Poker more interesting than ever is its refer-a-friend bonus. The online poker room rewards players who refer friends with a free bonus of £50 for the player and £25 for the friend. The promotions page of Sky Poker is packed with exciting events such as qualifiers to lucrative online and live poker events, a wide range of tournaments, a point-based reward for loyalty scheme, a wide range of bonuses, free poker, happy hours, and several other poker goodies. The most exciting of these promotions, especially for poker beginners, is the free poker feature. Whenever players play free poker games, they will be given the opportunity to win tokens to tournaments. For instance, if players play 20 hands in the course of a month, they will receive a token worth £1.10 free, and if they play 50 hands in the course of a month, they will receive a free token of £2.20. Another interesting promotion at Sky Poker is the Survivor Series, which promises a weekly guaranteed prize pool of £1000. Sky Poker Priority Club : As a member of Sky Poker Priority Club, players gain access to top online poker promotions, contests, and offers. Besides, players also stand the chance of participating in live Sky Poker tournaments held throughout the year. Players who wish to remain in the Priority Club need to continue playing real money poker and collecting 10,000 or more poker points every month. The online poker room takes into consideration players’ performance during the previous month while assigning them their Sky Priority Club membership. Sky Poker calculates the poker points and sends players an email notification at the beginning of every calendar month. The Sky Poker Tour is one of the most exciting features of Sky Poker as it offers a guaranteed prize pool of £250,000. Sky Poker has already announced the fourth season of the Sky Poker Tour, and ambitious poker players can get qualified by participating in the qualifier satellites at Sky Poker. Banking at Sky Poker is safe and secure because the online poker room adopts the latest encryption technology to protect players’ financial transactions and private details. Sky Poker players can use banking methods such as Visa, PayPal, Visa Debit, Maestro, Moneybookers, Laser, MasterCard, Neteller and Visa Electron to fund their accounts. Poker winnings can be withdrawn through the same method used to deposit funds. However, players must note that they cannot use credit cards to withdraw winnings, in which case they will have to use an alternative payment method. 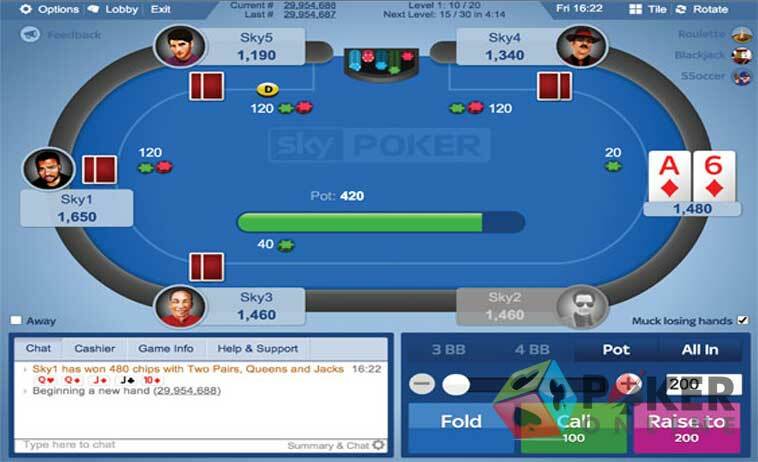 Sky Poker has an excellent Help and Support section, where players can find everything they need to know to play real money poker at Sky Poker. The online poker room encourages players to check out its comprehensive Frequently Asked Questions (FAQ) section, and if they still need assistance, they can use live chat, email the online poker room, use the telephone support, or write a letter to 2 Wellington Place, Leeds, LS1 4AP.